Inactive Ingredients: Cyclopentasiloxane, Salix Nigra (Willow) Bark Extract, Water/Eau, Dimethicone Crosspolymer, Butylene Glycol, Dimethicone/Vinyl Dimethicone Crosspolymer, Bis-Peg/Ppg-14/14 Dimethicone, Vaccinium Myrtillus Fruit Extract, Glycerin, Dimethicone, Caprylic/Capric Triglyceride, Cetyl Peg/Ppg-10/1 Dimethicone, Squalane, Phenyl Methicone, Saccharum Of_Cinarum (Sugar Cane) Extract/Extrait De Canne A Sucre, Bisabolol, Caprylyl Glycol, Tocopherol, Dimethiconol, Phenoxyethanol, Peg-60 Almond Glycerides, Acer Saccharum (Sugar Maple) Extract, Citrus Aurantium Dulcis (Orange) Fruit Extract, Enantia Chlorantha Bark Extract, Citrus Limon (Lemon) Fruit Extract, Phytosphingosine, Tetrahexyldecyl Ascorbate, Ethyl Linoleate, Ethyl Linolenate, Ethyl Oleate, Carbomer, Silica, Polysorbate 20, Oleanolic Acid, Nordihydroguaiaretic Acid, Palmitoyl Tripeptide-1, Palmitoyl Tetrapeptide-7. A weightless gel primer that mattifies the skin, treats blemishes with 1% Salicylic Acid and minimizes the appearance of pores. Apply before foundation application to ensure maximum blendability, even application, and all-day wear. Acne Treatment - 1% Salicylic Acid prevents and heals blemishes. Mattifying - Provides an instant matte finish and extended shine control. Pore-Minimizing - Visibly blurs pores. Works well with Normal, Combo, Oily, and Acne-Prone Skin. good for acne, not for keeping me matte ): I'm still on the search for the perfect primer... it was very frustrating to find that this primer doesn't keep me matte and doesn't keep my foundation on well. it was super expensive and I don't recommend it for super oily skin. I finally found the primer for me!! 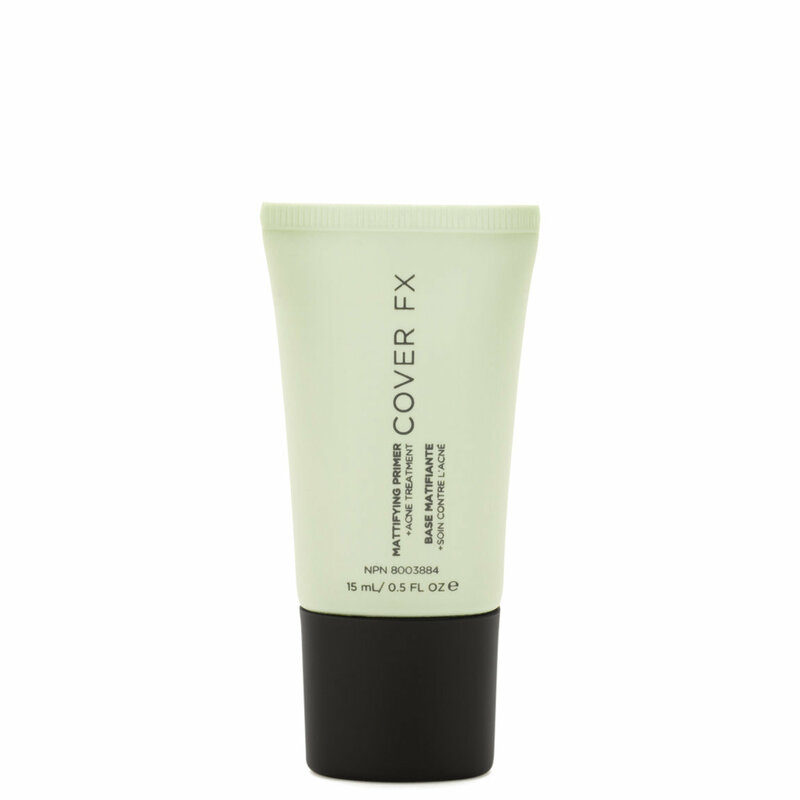 Thank you cover fx! This definitely mattifies the skin without drying it out. My Ysl foundation glides on it like butter and helps me have gorgeous glow in the right places. What I love this primer doesn't feel siliconish and have salicylic acid which helps treat and prevent acne. Hearing that ingredient is music to my esthetician ears. If you have oily or combo and acne problems try this!!! I've tried a ton of different ways for my oily skin to take makeup and not be an oil slick by the end of my work day and this has finally solved the problem. Not only does this primer help my makeup stay longer, I don't get that crazy-greasy shine. My face stays matte for 8+ hours! Also, I've noticed, even after just the first use, that it helps to clear up my skin. The Anti-Acne treatment is a total plus! Definitely my new favorite primer! I have an oily t-zone and acne prone skin. I have used many primers before and the only thing that comes close to this is the Smashbox one. This is my new favorite primer for the kind of skin I have. It goes on and makes my skin feel so amazing and soft. And it definitely does its job! My skin hasn't reacted adversely to it at all and I believe, in the short amount of time I have been using it, it is REALLY helping my skin out as it recovers from using MAC foundation. I really liked this product. I got it as a sample size and used it underneath my foundation. It really my skin matte and not oily throughout the day. The only reason it's not 5 stars is because if you have it sitting and don't shake it first it can come out very oily. Not as a great of a product as I had anticipated per the reviews. This is yet another product that leaves a white crumb like residue all over my face. Best primer I have ever used. I have very oily, acne-prone skin. I've tried all different kinds of primers from many different lines, and this is the first one that not only controls the oil for a good 6 to 8 hours (instead of being an oil slick I'm just "dewy"), but my pores and skin texture have improved. As others have mentioned, my only complaint is that the tubes do feel half fill, and it is on the pricey side. That said, it works. It is the first primer I've ever bought a second time. I was using MAC Prep + Prime Skin Refined Zone Treatment but I have been switching over to all vegan products. This is also cheaper - $16 for 15 ml versus $21 for 15 ml. It's not quite as good as MAC but pretty close. I'm happy with it and will keep using it.